The swimming pool can easily be converted into a creepy haunted place with a few bought or DIY props. Check out our best ideas. For an easy, dramatic effect add some pool dye to your swimming pool. Half of a 8 fl oz bottle turns a 15,000 gallon nice blood red for a halloween party. And don’t worry, this stuff doesn’t stain the pool liner, neither fibreglass nor vinyl. It does filter out within a few days. Then add some floating skeletons or body parts and watch your guests admiring the effect. 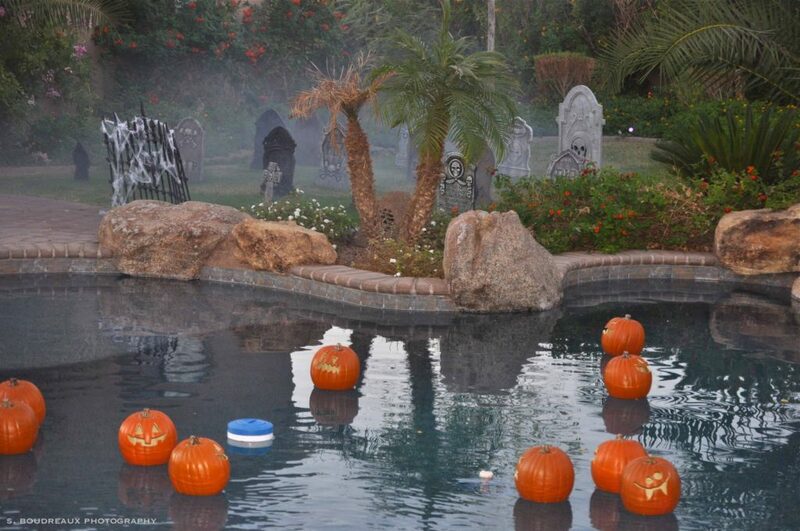 From floating pumpkins, flickering candle lights to glowing body parts, eerie skeletons and ghosts there are various possibilities to create a gruesomely spooky scene at your pool. 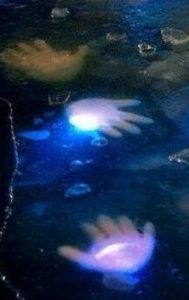 Cheap, easy and effective: Get a box of latex surgical or household gloves, insert glow sticks, inflate and presto you have a good number of glowing dead hands to float in your pool. Works well with clear and dyed pool water. Best to bear in mind who the party is for. If there are younger children to hold back on bloody body parts but go for Jack-o-lanterns and party halloween decorations. Less realistic is perfect for this age group. In fact, most young children will enjoy the dressing up and party feel more than being scared. If your party is for teenagers and/or adults the more realistic and creepy the better. Most people think of decorations to drape over trees and arrange in the garden. But a truly haunted house will have strange lights and emanate eerie sounds and surprising, scary effects. Just make sure to arrange everything with safety in mind, especially around the pool area. Make sure your guests don’t trip or fall into the pool at night. Halloween decorating is all about creativity and anything spooky, creepy and scary goes! 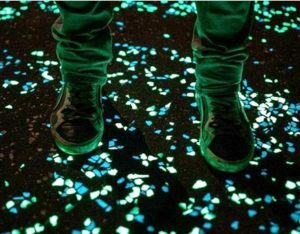 Fake tombstones, giant cobwebs, glowing pathways, bodyparts, strange noises. If it is all cloaked in mysterious fog even better. Low, dimmed light is hugely effective to create a a spooky atmosphere. Jack-o-lanterns shouldn’t be left out. Spread them out around the pool edge or, better still put them in the pool. Even though they are heavy they will float because they are hollow. Not a pool decoration but a wonderful FREE way to HAUNT ANY POOL and have great fun doing so: Music and stories: Take the time and listen to these. You could also let this run on a loop in a background somewhere. Then see how people stop in their tracks mesmerized to follow THE VOICE. This entry was posted in Pool Party on September 28, 2017 by Pool Urchin. Now there are some very, very, very very, interesting ways of doing this.